"Fig. 53. The upper process stages describe the application of probes like empathy probes. 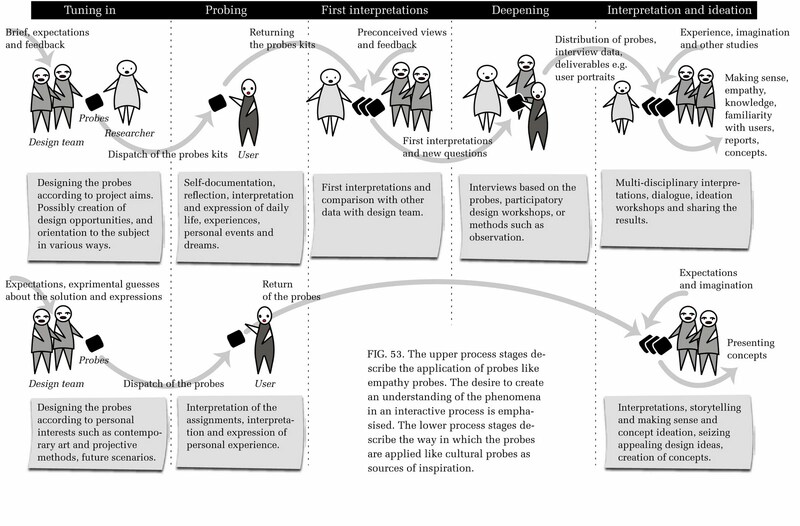 The desire to create an understanding of the phenomena in an interactive process is emphasised. 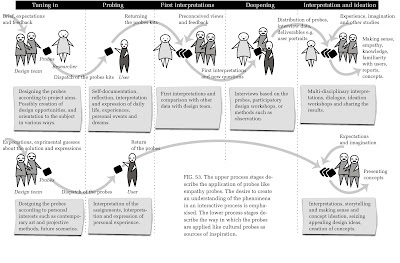 The lower process stages describe the way in which the probes are applied like cultural probes as sources of inspiration"
The application begins with "Tuning In" (bracketing in phenomenological methodology), then "Probing", followed by two forms of "Interpretation", one deeper (top) than the other (bottom). My rough adaptation of Mattelmäki's diagram showing how my use of the probe differs from hers. I am interested in using the probe to prepare each volunteer's perception - to help them attune themselves into understanding their own ability to appreciate experience from identifying a beginning until a consummation, without undue influence. Using the probe tasks they will in Task 1 attune themselves in their own way, with varying degrees of success or correlation to each other. In Task 2 which will be post-observation they will self-reflect and evaluate themselves, using their own method (mediated through the provided material in Task 2) to evaluate their experience. 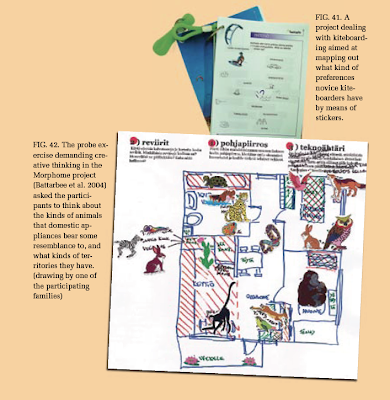 This method will be un-scientific, and Mattelmäki suggests that a more appropriate description would be "making sense, outlining or interpretation" (p88). I will give the Probes out to those who volunteer at a briefing (1). Each volunteer will then do Task 1 before coming to a pre-observation contextual interview (2). At this audio recorded interview (3) I will get a sense of who this person is, how they are preparing themselves to be observed, and to bracket and document any prejudgments they may have of the observation. They will then be observed using the interactive installation (videoed and photographed for reference) (4). Post-observation, the volunteer will be directed to do Task 2 before the next interview. This post-observation contextual interview (5) will be a de-brief, and the task result will be used to begin the recorded interview. This fragmented qualitative data will then lead to (6). 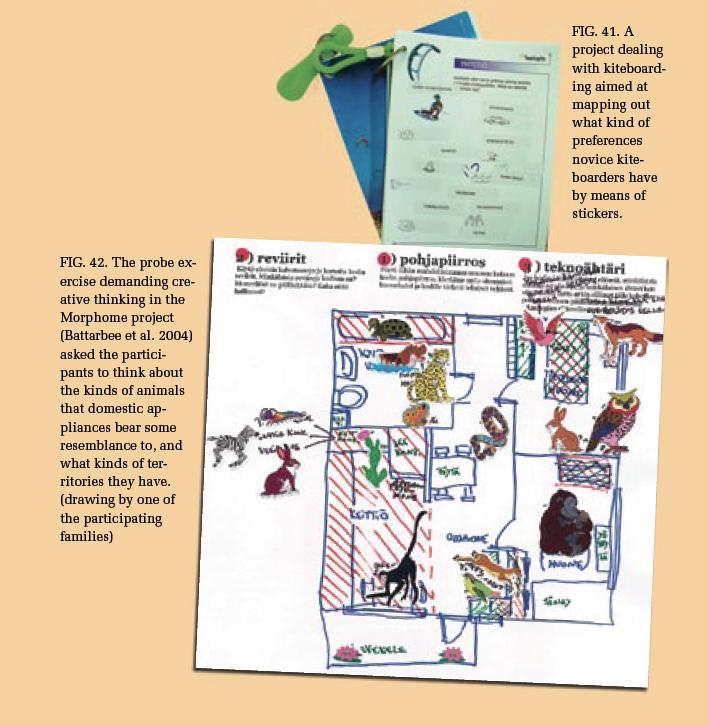 (6) is the development of a Visual Communication phenomenological framework. The development of my Probe will be detailed in a separate post(s). 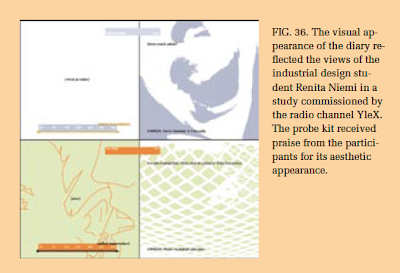 Here are some examples of different Probes from Mattelmäki's book. MATTELMÄKI, T. (2006). Design Probes. 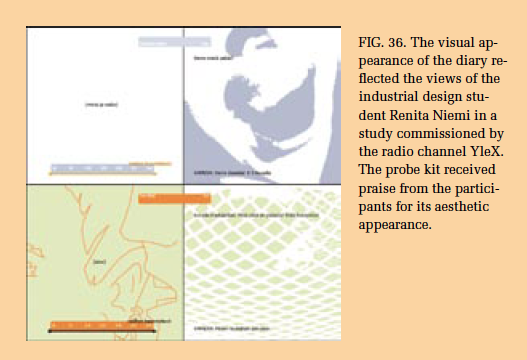 Unpublished doctoral dissertation, University of Art and Design Helsinki. Helsinki, Finland.